Nurses are some of the busiest people on the planet. They are constantly on the move, checking on vitals, patients, and making sure everybody is okay. Time is important in the medical field, seconds are very precious so a quality timepiece is essential for nurses. There are countless choices when it comes to watches, but the choice can be made easier as we take a look at the top-rated nurse watches below. This women’s watch looks like a watch that was designed to be worn with a scrub. 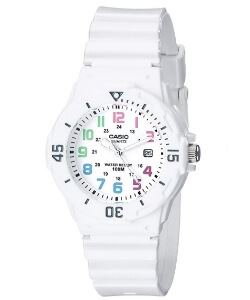 The bright white case and strap blend perfectly with the multi-colored Arabic numerals on the face. The molded resin band and buckle closure will make sure that the product won’t fall or slip off your wrist while on the job. When working as a nurse, you have to deal with different environments, so it would come as no surprise that the watch will get wet, but this watch is water resistant up to 100-meters so that will be no problem at all. 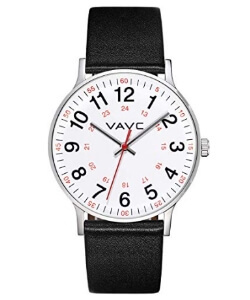 This is one of the best timepieces for nurses due to a combination of its simplistic design, quality materials, and accurate quartz movement. This is watch designed for the medical field. For starters, it’s available in multiple colors so you can match it with your scrub. The light colors invoke light and happy feelings, which is great when you’re in a very serious environment like the hospital. On the face of the watch, is bright red seconds hand designed for nurses so that they can take the most accurate pulse readings. The numbers on the face are large and easily read, so you won’t have to spend too much energy trying to tell the time when in a fast-paced environment. This yet another watch designed to be matched with scrubs. The product is available in around 18 different colorways for whatever style and combination you want with your scrub. The case is made of surgical grade stainless steel to keep everything as sanitary as possible, with a genuine calf leather strap. On the face, there are large numbers and highly visible hands to make your job as a nurse as easy as possible. The leather is soft and feels great on the wrist, but the best part is that it’s very easy to clean the watch, which is essential when working in the medical field. Most of the time, nurses are in uniform. So usually, a watch will be their only personalized item of clothing. 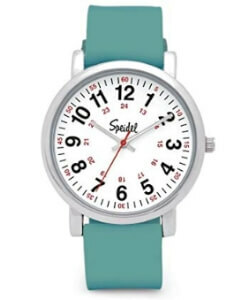 For nurse watches, it would be best to find designs that match your scrub. So light colors, as not to be too eye-catching, will be most recommended. Another thing to look at in the watch is the dial, it would be best to find ones that are easy to read, so keep your eye out for watches with large indicators, and hands that stand out. Time will always be of the essence when working in medicine, so an easy-to-read watch is very important. As a nurse, you will be handling a lot of different materials. It should come as no surprise that you will be encountering a lot of liquids, so a watch that isn’t water resistant will surely last you only a short while in the hospital. You don’t need to get a diver’s watch that’s water resistant up to 300-meters, but something around 100-meter water resistance would do you a lot of good. Sanitation is one of the most important priorities of medical practitioners, and that applies to everything, including your watch. A nurse’s timepiece should be easy to clean, and not hold that much bacteria as that can cause really serious problems in the future. Look for watches with soft leather straps, or better yet, get a watch with a resin band as those are very easy to clean. There are a lot of things out of your control when you’re working as a nurse. There’s a big chance that some incident at work will result in your watch getting damaged or broken, and you wouldn’t want to risk it by purchasing an expensive luxury watch only to find yourself looking for a replacement because of a workplace incident. Look for watches of high quality, that won’t bust your bank, and before you know it, you’ll have the perfect watch for you! Best Watches for Pilots: What are the Top Rated Options?